(b) Windows doesn’t defrag such disks by default, provided that it recognizes them properly. Hanselman cites “the Windows storage team” to affirm that volsnap copy requires optimization to keep the number of file fragments on an SSD below the allowable maximum. Volsnap is shorthand for the Volume Shadow Copy operation used to capture a snapshot of the drive to be used as a restore point, which then becomes available to the System Restore operation to roll the drive back in time to when the snapshot was taken. During this operation the file system follows metadata used to link file fragments together to “stitch them up” into a single logical extent that comprises all the individual physical file extents of which they’re made. If the number of fragments exceeds a critical maximum value, the file system can’t keep up with the fragments any more (and file copy or access operations can fail). 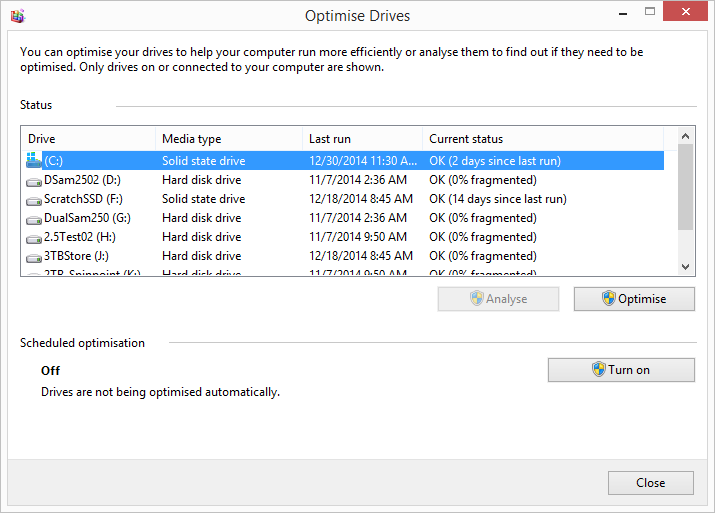 This can’t be allowed to happen so Windows schedules optimization on SSDs by default on the same day every month, starting from the day that the OS is installed (or if System Restore has been turned off for a drive, on the day that it gets turned back on).